I'm trying to get much better at photography, and it's so helpful to be able to see beautiful shots for inspiration. The other day, I was happy to stumble on photography by two sisters at Perfection Makes Me Yawn. I LOVE the lighting in their photos and their subtle attention to detail. Everything just blends wonderfully. 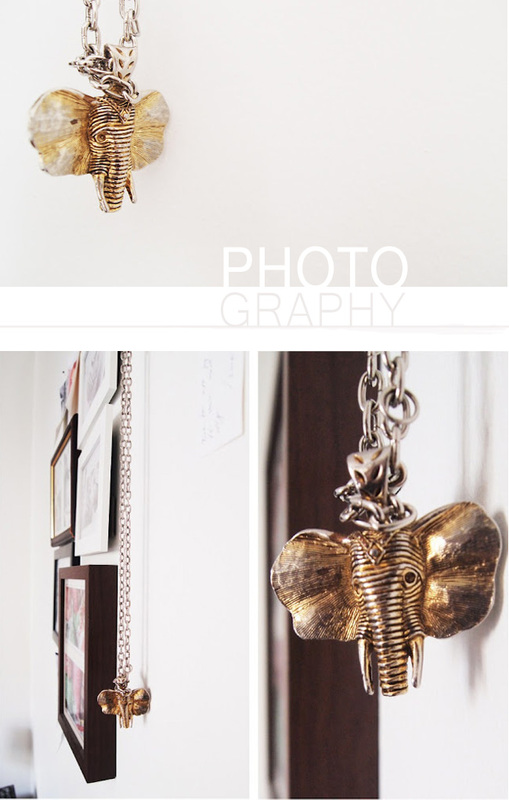 As if I didn't already want an elephant necklace, now I'll have to go on the hunt because these photos told me I need one. I love the positioning and the angles in the photos. I'm oftentimes a straight-on type of person, if that makes any sense (like in the top photo). Now added onto my list of photography goals: experiment with angles. Oh, if only you could see me over here gawking at these details. I guess I need to paint my nails two-toned also! So yeah, I want to be able to drag my big camera around and actually take (good) impromptu photos with it. I always have to use my iPhone for shots that aren't staged / need to be taken QUICKLY. And when I stage photos, it takes me about three hundred years to get the shutter speed and aperture correct, and then I take one million photos to choose about three from. You live and learn, though! It's exciting to think where I'll be with photography in one year from now. What about you? Are you learning (or plan to learn) something new that excites you? Oh I love the elephant necklace, how cute! I'm right there with you on wanting to take better photos! I LOVE that shot from the side of the wall / picture frames...so unique. Three hundred years to get the shutter speed and aperture correct? I can completely relate to this like a thousand times over. I also find myself getting really overwhelmed with editing those three pictures. There's just so. many. choices! But, I have to say, that one really awesome, I can't believe I took that picture is totally worth it. I'm also trying to get better at capturing great photos. It's hard because I haven't gotten myself to take the plunge and buy a really nice camera. Right now I just have a little point and shoot. Someday, I'll invest and try to get really good shots. I agree with you! I also tend to do just straight on. Must start experimenting! I would love to better my photography skills! My camera is very average and I hate to admit that I use my iPhone for most of my photo taking. If photoshop wasn't so darn expensive I'd buy it in a heartbeat! There's a few online photography courses I want to take. I love capturing moments of my life in photographs, but I definitely wish I was better at it. Oh my, I ALWAYS need a new elephant necklace! I'm obsessed! great pics. the lightning is really great! Yi-chia: Oh, I think it's the best! Lena: You always make me laugh out loud! It. is. SO. HARD!! I know that awesome feeling, though! I need to learn to know what I'm actually doing during the process. Abby: You totally aren't the only one, dear! Ugh, yeah, Photoshop is a bit painful to pay for. I heard Photoshop Elements works alright...surely it's much cheaper? Although, if you're in school, you should definitely check and see if you have a student discount for Photoshop! It might be worth it if you use it constantly. Jess: ME TOO!! It's too adorable!! Chic at the same time, though. Daisy: Thank you! I love their work! Thanks for visiting! The Divinitus: I'll keep you posted! Hopefully I'll just move forward from here. :) Thank you for coming by! I think most people who have blogs where they post lots of pictures are interested in photography sort of by default. Being able to take good pictures is really valuable for a blogger or for people selling stuff online or for anyone who is "show and tell-ing". I'm also always trying to improve my photo skills. It feels never ending, but it's quite fun. I'm right with you! I always take 50 pictures and only save 2 or 3 of them. I'll take a picture of my hubby and then he'll walk away like I'm done. I get so exasperated trying to explain to him he needs to sit still until I get the settings right. "But that picture looks fine," he says. But I don't want "fine"! I want "perfect"! Hehe. Fashion Cappuccino: BIG props to you for taking your own photos of yourself! Gosh, I tried to do that the other day because I'm working on modifying the layout of this blog, and I want a real about page that doesn't have me making a snarky face (that's usually what seems to happen in my candid photos). I took SO MANY!! I can't imagine having to do fashion posts...it takes a special type of patience! I definitely appreciate all the work that goes into editorials as well! Sadie: Your husband and mine would probably be BFFs! His attention span is like that of a fly. He's like, "Okaaay, we've been here for about 3 minutes...are we finished??" I'm bitten by the perfection bug daily. I need to leeeet goooo. So glad you that you like our work! *lol* we are also struggling w shutter speed and different setups, trust me!! It is a constant fight going on between us and the camera. Two things we've found out that really helps you taking flawless photos is an external flash and a huge portion of patience! ;) These things will take you far!! Atta & Maja: I LOVE your work!! Flash?? Wow, I wouldn't have guessed! I'm always told to avoid flash like the plague, but it's obviously working in your photos! My cousin's husband showed me how to cover the flash on the camera with a napkin or thin piece of cloth, and it kind of helped. I definitely need to experiment! Thank you for the inspiration and pointers! but am still just guessing. Blogging for sure is a great platform to push ourselves to experiment and improve though! But soon I think I'll be enrolling in a little photo workshop, self-education is slow going! Ada: I really need to do the same also! BOTH of them! Nomadic D: Oh, me too. Not to worry. It's a long process for me to learn, but I'm enjoying it. I'm definitely going to check out your new friend! My husband has a Nikon D60, and it's been great to learn on. He was able to buy it used from a friend, so that was even better! Can't wait to hear how your photo workshop goes!